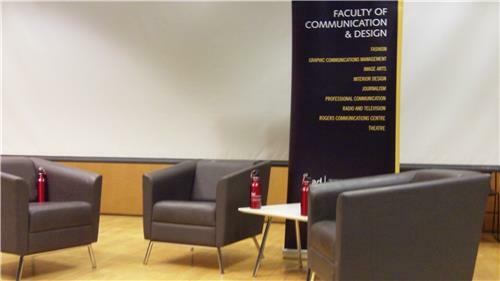 The Faculty of Communication and Design presents a lecture series on developing skillsets for the 21st century. 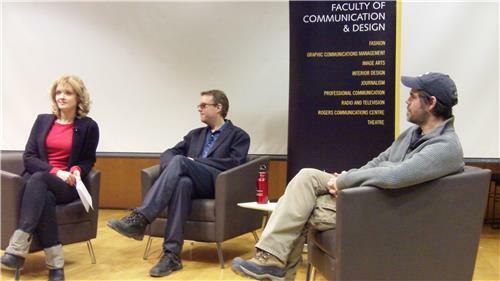 Welcome to the Dean's Lecture Series: Technology Panel - Developing Skillsets for the 21st Century. 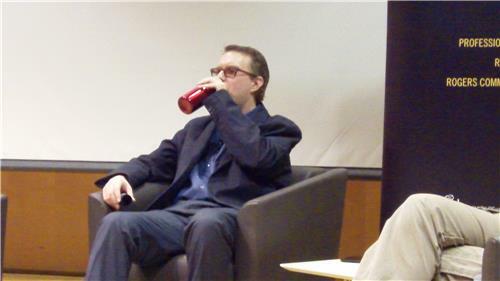 The panelists get FCAD water bottles instead of the traditional glasses of water. Technology not only provides a basis for educating students about the fields in which they will pursue work, but it also serves as the platform from which many of us will launch our careers. Some say that carbon print may be on its way out, but technology will provide a lasting canvas for communications. Sue Gardner, executive director of Wikimedia, is sick and won't be attending. Jesse Hirsh and Lance Weiler will be today's panelists. Hirsh is an Internet strategist and broadcaster and Weiler is a technology storyteller, entrepreneur and thought leader. Sound check -- One, two. All systems "go." "Jesse and Lance are thought leaders," says Shirley Lewchuk, event organizer and director of outreach and communications for FCAD. 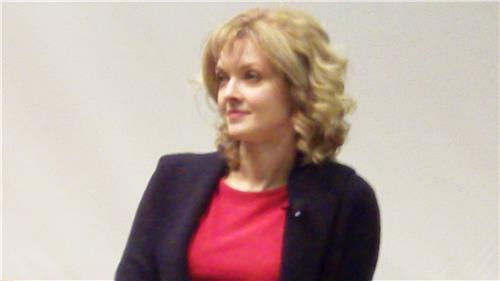 "I think there is a lot to learn from them," Lewchuk adds. "Tonight we have a very special group of guests," says Gerd Hauck, Dean of FCAD. "Each of the guests have a very special relationship to Ryerson." 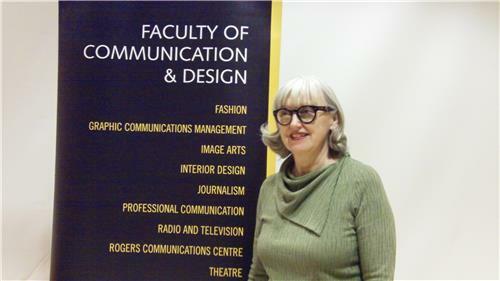 Sue Gardner is a Ryerson Journalism grad and recipient of an honorary doctorate (though she is absent tonight). Weiler is our Distinguished Producer in Residence, and Hirsh, who was contracted by Rye to do a special TIFF interview, is teaching Hauck to golf. "He is literally mad," says Hauck of Hirsh. Pringle, left, with panelists Jesse Hirsh and Lance Weiler. "Users are constantly challenged on how to use technologies to the best of their abilities," says Ramona Pringle. 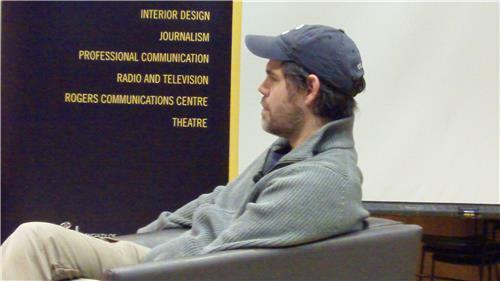 Pringle belongs to the RTA School of Media and hosts the video podcast, Rdigitalife. Weiler's movie, The Last Broadcast, came out the same year as Titanic. "Not only did we go on to make that movie for 900 dollars," says Weiler, "I convinced digital projector companies to give me projectors for free." Hirsh says he was an anarchist between the ages of 18 and 26. "The only thing I really wanted to do was feed my brain. I started to think of the Internet as a big learning curve. As long as you were at the top of that curve, people would pay you to teach them what you know." "If all the knowledge of the world should be available to all the people of the world, there should not be economic constraints, i.e. intellectual copyright. Here, at our fingertips (gestures with phone), is all the knowledge in the world. And why should we limit that?" -- Hirsh. "I'm a storyteller, and I learned how to tell the story of software, and how to tell other people that story," -- Hirsh on open source infrastructure. "I hear jargon and I start to literally break out in fits," says Hirsh on his loathing of "cool kid" tech circles. Hirsh needs a drink after all that venting. Before social media, before Facebook, before Twitter, somebody pitched citizen news to CBC...and they turned it down. Can't say Hirsh didn't warn ya, CBC. "I've always found that I do the work and the classifications come with it," says Weiler on his "thought leader" status. "A lot of the work that I'm doing currently has very dispersed teams with very diverse skills...the innovation happens at the edges of those places," says Weiler. "I embrace that idea of being able to experiment. If someone wants to call that 'a thought leader,' that's fine," says Weiler. "I think of myself as an outlaw. I'm a pirate and proud of it," says Hirsh. "There's this Bob Dylan song about rambling, gambling Willy. And I almost feel there's that hustle to the Internet and media. Except you can't leave town at the end of it. I just recently reconnected with my grade 6 girlfriend! I've kind of got this idea of the Internet as gravity, where everyone you know will eventually be there. So you HAVE to be moral and you HAVE to be ethical," says Hirsh. Is the world ready for a hero? For Snowden, for Manning? Good question. Pringle asks: "So what are the skill sets of the 21st century?" "Learning, entrepreneurism," says Hirsh. "I think listening is a really, really valuable skill. That and empathy. I think those things are underrated. I do work...that goes across a wide spectrum... it's that ability to feel something for somebody else. I'm constantly trying to evoke empathy or emotion with technology, something that is considered very sterile," says Lance Weiler about the peripheries of our accepted "core concepts." "Now authority is based on your ability to tell a story," says Hirsh. "Not only is that going to translate into more followers on Twitter and more likes on Facebook, but people will have respect for you." We should strive to customize the story for the audience.